One of the most successful investment strategies is also one of the most sensible. It’s a strategy that focuses on large, dividend paying companies that have a proven history of consistent and profitable dividend growth. Find shares with high dividend yields and consistent long-term growth – A high dividend yield is enticing, but it’s often a sign of a weak company and a dividend which may not grow in line with inflation. The online and interactive stock screen can help you find high yield shares from high quality companies – those with long histories of consistent growth in profits and dividends. Know what to buy and what to sell to keep your portfolio in top shape – Buying attractive investments is just the first step. Investing in shares is like gardening in that a portfolio will do best if it is actively managed rather than left to fend for itself. UK Value Investor’s simple, step-by-step investment strategy covers every step required to build and maintain a portfolio of high quality, high yield shares. Follow a £50,000 model portfolio – This model portfolio is actively managed to show you how the stock screen and step-by-step investment strategy can be combined to manage a portfolio over the long-term. It contains a widely diversified group of high quality, dividend paying companies, with just one buy or sell decision being made each month. Learn more about investing and analysing companies – There is more to investing than simply following a mechanical stock screen or going on the latest ‘tip’ from an investment guru. If you don’t understand the details of why a particular investment is or isn’t attractive, you’re unlikely to ever “trust” your investments enough to hold them through thick and thin. 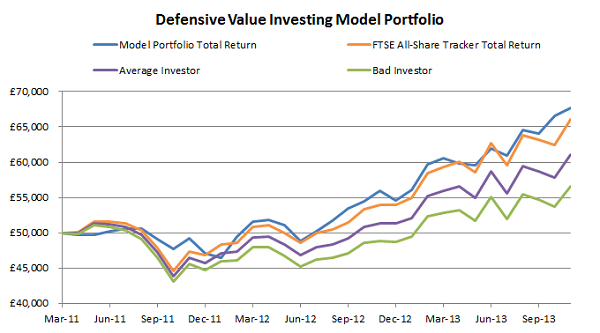 That’s why each issue of UK Value Investor includes a detailed explanation of the how and why of each investment decision, as well as covering the theory and practical aspects of defensive value investing. You’ll also have access to downloadable worksheets, spreadsheets and guides to help you understand and apply the investment strategy in the real world. Get help and support when you need it – To help you get the most out of your membership you’ll get priority email support. As Mr G Shields (an existing member) put it, “The fact that you always respond in such a timely and considered manner is a very attractive feature of your service”. This screen makes it incredibly easy to find shares in large, successful businesses that pay a consistently growing dividend. It also makes it very easy to find these companies when their earnings and dividend yields are high. Your membership is centered around the monthly newsletter which covers: the latest market valuations; the model portfolio’s recent performance and current holdings, a detailed analysis of one buy or sell decision each month; and the full results of UK Value Investor’s unique stock screen. Finding potential investments on a stock screen is just a small part of the whole investing process. Most investors will want to do some additional research on the company, and will have to decide how the shares in question fit into their overall portfolio. UK Value Investor’s step-by-step investment strategy covers these topics and is based on the work of investors such as Ben Graham and Warren Buffett. In each new issue of the newsletter you’ll get a full update on the portfolio, including reviews of existing holdings when they publish a new full or half-year report. The investment strategy and model portfolio both follow a policy of active portfolio maintenance, which involves selling the least attractive shares one month, and replacing them the following month. This process is covered through monthly buy and sell decisions. With each new buy decision you’ll see a detailed example of how investments are selected using this strategy. A stock which ranks highly on the stock screen is put through its paces using a multi-point investment analysis checklist to make sure it is not just high yield, but from a high quality business too. Each sell decision lets you know when an existing holding is being sold from the model portfolio. This includes a review of the investment, detailing when and why it was bought and why it’s now being sold. Typically, investments are sold when the share price goes up too far, lowering the yield and increasing the risk that the price will fall back down again. This is where you can download the full newsletter archive, strategy guides, worksheets and other exclusive content. As a member you’ll get priority email support and your questions answered in detail, usually within 24 hours. The UK Value Investor Membership Program has a simple goal: To provide members with the best tools, information and education for finding high quality, high yield shares, and to provide the most helpful support possible. To achieve this level of service, membership is limited to just 250 investors. How has the model portfolio performed so far? The model portfolio was launched in March 2011 as a £50,000 virtual cash portfolio. During 2011 the cash was gradually moved into high yield shares from a number of very successful companies, and the policy of active portfolio maintenance has been in place ever since. At the same time a £50,000 virtual cash benchmark portfolio was created and invested into a FTSE All-Share index tracking unit trust. The chart above shows the results of the model portfolio compared to a buy-and-hold passive index tracking strategy, as well as two notional investors, an “average” investor and a “bad” investor. The average investor underperforms by around 3% a year: According to the Barclays white paper “Overcoming the cost of being human”, active investors underperform the funds and shares that they own by around 3% a year. The average “bad” investor underperforms by around 6% a year: Another investigation into how investors actually perform was carried out by Pete Comley in his book “Monkey with a pin”. Pete estimated that investors were underperforming by anything up to 6% a year. You can see the latest results in more detail in the sample editions of the newsletter which are available on the website. I have tried to cover everything on this page, but if you have any questions about the newsletter or any other aspect of the membership program please feel free to drop me an email or get in touch via the website. Money Back Guarantee: Cancel by email at any time within your first 30 days and you’ll receive a full refund. Cancel after 30 days and receive a pro-rated refund. Does it take a lot of effort and time? How much time you devote to your investments is up to you. However, regarding the UKVI investment strategy, it has been designed with time efficiency in mind. For example, it deliberately restricts trading to just one buy or sell per month. This means that most of the time there is virtually nothing to do, and no money spent on excessive trading fees. This fits in with the ideas of many great investors who think that sound investing is about making a few good decisions, and sticking with them, rather than rapidly buying and selling shares in an attempt to outsmart the market. Using the model portfolio as an example, it takes about one or two full days per month to manage the portfolio. The rest of the time there is literally nothing to do other than collect dividends. What has the Model Portfolio invested in recently? Tesco – One of the world’s largest retailers, with over 500,000 employees. Centrica – The company behind the British Gas brand. Rio Tinto – One of the world’s largest producers of iron ore.
Go-Ahead – One of the UK’s leading providers of bus and rail services.